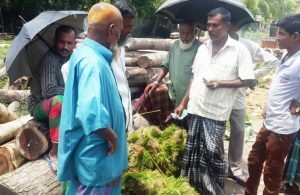 Farmers in Laharhat, the riverine char (islands formed from sedimentation) of Barisal district in southern Bangladesh, are witnessing a change to their traditional agricultural practices. Soon after the monsoon rains last year, farmers grew Aman rice, which has been a traditional practice in this region for many years. Last year, however, they followed the rice crop with wheat, which was new for this area. “We thought one crop was enough for Laharhat. We had limited knowledge and resources to grow a second crop here,” says farmer Enayat Hawlader. “This year we saw a miracle. I did not even imagine that this land could produce more. And, wheat grew well here,” shares Nantu Hawlader, another farmer. Earlier, farmers used to grow only one crop in this char during the Aman (September to November) season. The rest of the year the vast land would remain fallow. “We used to think this char had no capacity to grow more,’ says farmer Habib Mollik. During 2011-12, Bangladesh Agricultural Research Institute (BARI) started adaptive trials of wheat in a limited area in Laharhat. In winter 2013, CSISA-Mechanization and Irrigation (CSISA-MI) started to work initially with 12 farmers to practice mechanization for improving yields. CSISA-MI introduced PTOS (power tiller operated seeder) in the demonstration plots, which resulted in better profits and attracted new farmers to grow wheat using PTOS. Md. Washiq Faisal, Agriculture and Machinery Development Officer, CSISA-MI, says, “This year we proved that the vast char land of Laharhat could be properly utilized to produce crops.” In February 2015, during the harvesting of wheat with a reaper, enthusiastic farmers came to see the results. They were amazed to see that the yield had reached 3.71 tons per hectare. “The farmers who visited to see the harvesting of wheat with multi-crop reaper wished to cultivate their fields in coming seasons,” adds Faisal. In the dry season this year, about 30 percent of Laharhat, that used to remain fallow earlier, has been brought under wheat cultivation after paddy harvesting. According to Yunus Hawlader, the local service provider (LSP), there is opportunity for more LSPs to provide services in the next season as it is not possible for him to support the huge number of farmers in Laharhat alone. According to Alam, in a few cases where farmers used to grow lentil as a second crop, farmers have switched to wheat as it gives more profits. Farmers have also adopted new technologies like PTOS, axial flow pumps and reapers for better yields. “Laharhat will no longer be considered fallow in future,” he added. In June, CSISA led a 10-member delegation of senior officials from National Agriculture Research and Extension Systems (NARES) from Bangladesh, India and Nepal to Washington, DC for a meeting with the Modernizing Extension and Advisory Services (MEAS), followed by a workshop entitled, ‘Strengthening Agricultural Research, Extension, and Input Markets in South Asia: Evidence from Regional and Global Practice,’ organized by International Food Policy Research Institute (IFPRI) and International Maize and Wheat Improvement Center (CIMMYT). MEAS, a USAID-funded initiative, helps to define and disseminate good practice strategies and approaches to establishing efficient, effective and financially sustainable rural extension and advisory service systems in selected countries. The visit provided an opportunity to all the participants, working in close collaboration with National Agricultural Research Systems and International Agricultural Research Systems (IARS), to exchange ideas based on their diverse experiences of implementing extension services in different parts of the world. The theory of change model was highlighted during the deliberations for improving the performance of workforces in research-for-development in South Asia. The workshop looked at addressing multiple questions that will help improve extension systems in South Asia. Are extension programs cost-effective in South Asia? Can new approaches empower smallholder farmers, particularly women? What performance indicators can researchers use to determine whether programs are successful? How can policies encourage farmers to adopt new technologies and practices without exhausting limited development funds? Among a variety of other topics, participants discussed the effectiveness of subsidies to promote farmers’ adoption of agricultural inputs. Madhur Gautam, lead economist in Agriculture Global Practice at the World Bank, noted that the purported benefits only accrue under certain circumstances. Subsidies often remain in place long after their positive impacts have diminished, diverting scarce resources from other potential investments that may yield greater long-term returns, such as agricultural R&D and rural infrastructure. In South Asia, subsidies were largely successful at addressing market failures during the early days of the Green Revolution. Yet market conditions in the region have improved considerably, and policymakers need to adapt their policies and investments accordingly. How to make systems more equitable by linking gender and nutrition across extension programs and organizations. Further, participants and their respective organizations from each country (Bangladesh, India and Nepal) will work with CSISA partners to focus on local research agendas in extension and innovations. A team of seven participants from India was led by Dr. Ashok Kumar Singh, Deputy Director General (Agriculture Extension), Indian Council of Agriculture Research. Bangladesh was represented by Dr. Mohammad Zakir Hasnat, Agriculture Information Service and Sheikh Md. Nazim Uddin from Department of Agriculture Extension. From Nepal, Dr. Rajendra Adhikari, Joint Secretary, Ministry of Agricultural Development, participated. In addition, the delegation toured the US Capitol building and met with Senator Mark Warner, head of the Indian Caucus in the US Senate. 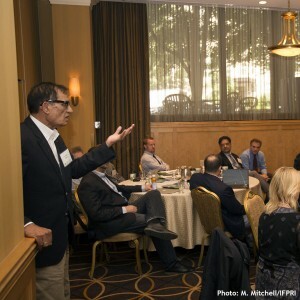 Source: Excerpts from the summary of the workshop are posted on the IFPRI website. To read the full summary of the workshop, click here. In Bangladesh, women usually do not work on agricultural tasks such as preparing seedbeds, transplanting seedlings, weeding and applying fertilizer. They do, however, manage approximately 80 percent of all postharvest activities. They also manage pond fish culture in their homestead area, a practice that has become increasingly popular. Nearly every household in southern Bangladesh today has a small pond, but few are optimally managed. One of the objectives of the Cereal Systems Initiative for South Asia in Bangladesh (CSISA-BD) is to increase women’s participation in agriculture to reduce the gender gap and enable women and men farmers to innovate and adopt improved technologies and varieties. 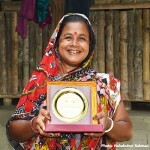 In 2012, Urmila Shil joined one of the 25 women fi­sh-farming groups created by CSISA-BD. Shil lives in a remote village in West Kirthipasha, Jhalakathi sub-district, Southern Bangladesh, with her husband and three children. Over the year, she received training and support on household-based pond aquaculture and horticulture for income and nutrition organized by WorldFish. In 2013, Shil harvested a total of 496 kg ­fish from a 20 decimal (247 decimal = 1 hectare) homestead pond that was valued at BDT 67,456 (US$ 865). She earned another BDT 3,380 (US$ 43) from dike cropping. “Earlier we could barely afford to buy ­fish once a week. Now we can have fresh fi­sh and vegetables every day,” she says. Shil was named ‘Best Fish Farmer’ during National Fish Week 2014 and is one of the 63 award-winning farmers working with CSISA-BD. Many women living in her village have been inspired by her success. They too have undertaken initiatives to improve their family income through aquaculture and homestead gardening. Shil regularly shares her knowledge and experience with them so that they can replicate her success. The USAID-funded CSISA-BD is a fi­ve year initiative implemented through a collaboration between three CGIAR centers, the International Rice Research Institute (IRRI), International Maize and Wheat Improvement Center (CIMMYT) and WorldFish. It works to increase productivity by increasing women farmers’ access to suitable technologies, information and markets. To know more, visit the CSISA Bangladesh page. A recent research report ‘Groundwater Management in Bangladesh: An Analysis of Problems and Opportunities’, published by the USAID Feed the Future Funded Cereal Systems Initiative for South Asia – Mechanization and Irrigation (CSISA-MI) project, highlights that the policy focus in Bangladesh so far has been largely on ‘resource development’ and not sufficiently on ‘resource management.’ This has resulted in drawdown of aquifers in intensively irrigated areas and high expenditure on subsidies to support the energy costs of pumping water for dry season irrigation. Unless water use efficiency practices and policies are adapted and adopted, these challenges in groundwater irrigation can become a serious threat to sustain agricultural growth in Bangladesh. “Dry season rice production using irrigation helped Bangladesh to increase its total rice production from 18 million tons in 1991 to 33.8 million tons in 2013. 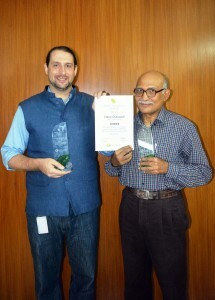 However, this dramatic increase in rice production comes with costs – namely the high energy requirements needed to extract groundwater by pumps, which is a concern giving mounting fuel and electricity prices in South Asia” said Timothy Krupnik, CIMMYT Agronomist and co-author in this study. Diesel pumps consume about 4.6 billion litres of diesel every year to pump groundwater for dry season rice production, costing USD 4.0 billion. This cost is in addition to USD 1.4 billion of yearly energy subsidies supplied by the Government of Bangladesh (GoB) to maintain groundwater irrigation. Such considerable investments add to the energy cost burden, and may not be financially sustainable in the long-term, the report says. This conclusion is underscored by the GoB’s interest to reduce energy subsidies and shift from ground to surface water irrigation, which is energy-wise less expensive. The report highlights several supply- and demand-side solutions for sustainable groundwater management. Improving water use efficiencies through the adoption of resource conserving crop management practices such as direct-seeded rice and bed planting could help in reducing groundwater demand for agriculture. In surface water irrigated areas, use of more fuel efficient axial flow pumps that the CSISA-MI project is working with the private sector to scale out, is also crucial. Water demand for irrigation can also be reduced by rationalizing cropping patterns – specifically by shifting from rice to more profitable crops like maize, and to other food security cereals like rice, in areas where groundwater is a concern. Involvement of water users, investments in improved water and agricultural technologies, and providing extra support for farmers making transition to less water demanding crops is needed. Since the concept of ‘more water-more yield’ is still prevalent among farmers, the report also highlights the need for policy to focus more on awareness raising through educational programs aimed at wise water use and volumetric water pricing. In addition to technical solutions, strong linkages and improved communications between different organizations involved in the management of groundwater resources will also be required to shift to a more water productive, and less costly, agricultural production system in Bangladesh. Agricultural mechanization in South Asia is helping conserve natural resources, improve productivity and increase profits, but many small-scale farmers have yet to benefit from emerging sustainable farming technologies and machinery. Factors such as the high cost of machines and farmers’ lack of access to finance make the machinery unaffordable for resource-poor farmers. However, Bangladesh leads by example and has been a hotbed of innovation, particularly with the 2WTs that are more appropriate for small-scale farmers than the four-wheel variety. Bangladesh has a strong agricultural tradition – nearly two-thirds of its population works in agriculture. It has achieved near self-sufficiency in rice production and has rapidly developed its agricultural sector over the past 20 years, despite being ranked 146th on the global human development index and having roughly half the per capita income of India. Bangladesh’s agriculture sector contributes 19 percent to the country’s gross domestic product. This is the bright side. The other side, however, is that farmers’ land-holdings are very small – an average farming household owns just 0.2 hectares or less – and Bangladesh is home to intensive cropping rotations. Every square centimeter of arable land is used 1.8 times a year, putting intense pressure on natural resources and making the system unsustainable in the long term. Farmers have to continually adapt to challenges including climate change, rising temperatures and increasing fuel prices to sustain productivity. As a result, many farmers are using innovative agricultural machinery to improve the precision and speed of planting and harvesting operations while reducing fuel, irrigation water and labor requirements. With the introduction of cheap, easy-to-operate and easy-to-maintain 2WTs, agriculture in Bangladesh has become highly mechanized during the last decade. Nearly 80 percent of farmers use 2WTs because they are versatile and can be fitted to a variety of innovative auxiliary equipment for planting, threshing and irrigation. 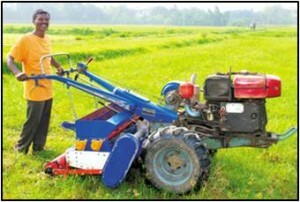 A new CIMMYT book, Made in Bangladesh: Scale-appropriate machinery for agricultural resource conservation, highlights the innovative machinery that can be used with two-wheel tractors (2WT) for sustainable farming and gives detailed technical designs to help standardize production quality, making the machines more accessible to farmers. The information in the book is meant to have real-world impacts. Each chapter has scaled technical designs of the machinery, developed with computer-aided drafting to allow manufacturers in Bangladesh and beyond to reproduce and make improvements on the machines. The chapters focus on zero tillage, strip tillage seed and fertilizer drills, bed planters, axial flow irrigation pumps, strip tillage blades, improved furrow openers and seed metering mechanisms. “Many of the machines in the book are inspiring innovations,” said Timothy Krupnik, CIMMYT cropping systems agronomist and one of the book’s authors. “Bangladesh is often seen in a negative light – most international media focuses on its political tragedies, grinding poverty and pressing environmental concerns. But, if you live in Bangladesh, you can see beyond this because you get inspired every day by the creative ways that many of the world’s poorest people come up with creative solutions to the problems they face. All of the machines in the book were either designed and made in Bangladesh, or borrowed from other machines in South and Southeast Asia and then were manufactured in Bangladesh.” The book’s technical designs can be easily replicated by machinery manufacturers, scientists or farmers. “The drawings were developed in a reverse engineering process, where I measured the machines manually and immediately sketched them on paper by hand,” said co-author Santiago Santos Valle. “Once back in the office, I produced the computer-aided drawings using the hand-made sketches.” A learning module on technical drawing interpretation and instructions on how to use the drawings have also been included. Santos Valle added, “While developing the book and working on the drawings, we did a training workshop with local manufacturers and machinery researchers from partnering institutions in Bangladesh to familiarize them with the drawings. The learnings and feedback from the workshop helped to develop and improve the learning module and the instructions included in the book.” Standardization and Affordability There is a great need for small-scale farmers to adopt new machinery in order to overcome rural labor shortages in Bangladesh, which become more severe each year. “Wheat and maize yields decline between 1 and 1.5 percent per day when planted late, so you can imagine the effect if you use the machines to reduce tillage,” Krupnik explained. “Applying seed and fertilizer in one go can save seven to eight days that farmers would have otherwise spent plowing and preparing the land.” One of the most significant problems confronting mechanization in South Asia is design standardization. “Bangladesh has been a ‘hot bed’ of innovation, particularly for the two-wheel tractor,” said Andrew McDonald, CIMMYT cropping systems agronomist and co-author. “But much of this innovation has not reached farmers at scale because commercialization has been impeded by the lack of standardization. Essentially, most workshops create a unique machine every time a new piece is fabricated, which drives up costs to both manufacture and repair the machinery. Quality control is also an issue.” He emphasized that CIMMYT is playing a catalytic role to ensure high-quality machinery is available at a reasonable cost in Bangladesh. The organization is helping formalize the design elements of innovative machinery and working with workshops and industrial houses to implement these designs. In the USAID-Bangladesh Mission funded project, Cereal Systems Initiative for South Asia – Mechanization and Irrigation (CSISA-MI), CIMMYT partners with the NGO International Development Enterprises (iDE) to develop and execute business models to encourage companies and agricultural manufacturers to produce and distribute the machines through commercial mechanisms. In turn, agricultural service providers are linked to finance entities and farmers to purchase machines and to assure demand in the field. These efforts are boosted by technical backing from CIMMYT scientists who assure that land is planted with reduced tillage implements or irrigated with energy efficient pumps. As a result, the adoption of these machines has significantly increased in the last few months – the machinery is now being used on over 2,000 hectares of new land in southern Bangladesh alone – more than a four-fold increase compared to the year before. 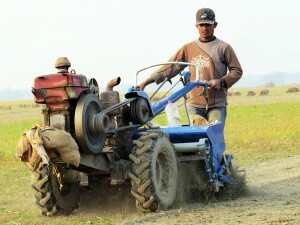 The machines included in the book have wide applicability and use outside of Bangladesh, and can be used in many smallholder farming contexts in Asia and Africa. “We want the work done in Bangladesh to inspire agricultural machinery manufacturers to reproduce and improve machines in other countries,” Krupnik said. “For this reason the book is free and available through open access and can be downloaded, printed and shared with others as widely as possible.” The PDF version of the book is available online and can be downloaded from the CIMMYT repository.